Long range shooters rejoice: Savage Arms has unveiled their new .338 Lapua Magnum Tactical rifle, using the .338 Lapua round that has a maximum effective range of 1910 yards. The beginnings what is now known as the .338 Lapua Magnum began back in 1983, when a company by the name of Research Armament Industries began work on this project using the .416 Rigby as the parent case. That specific project ran into financial difficulties. 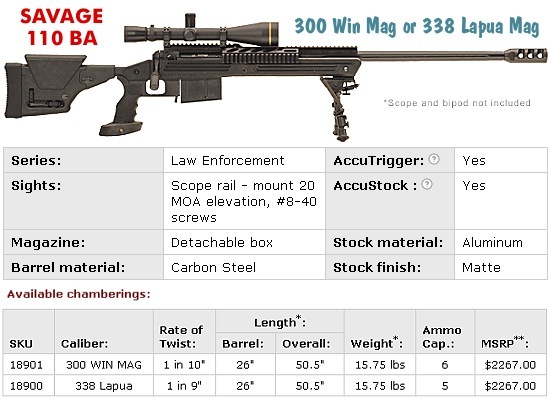 Lapua designed and released the .338 Lapua Magnum in 1989 when it was registered with the C.I.P. Lapua used an extensive redesign of the .338/.416 cartridge case, using varying brass hardness to come up with a uniquely pressure resistant case. The following image shows the .338 Lapua Mag compared to a .308. 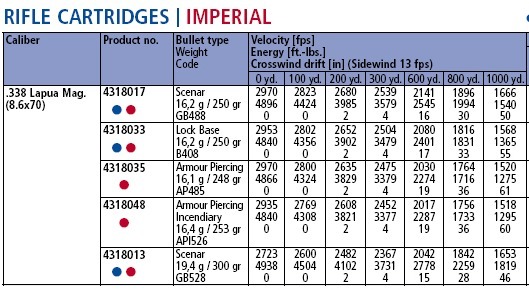 The published Lapua ammo specs, using a 27 inch test barrel, are as follows. The cartridge can deliver consistent hits at 1,500 yards and a .338 rifle weighs only a couple of pounds more than many tactical .308 rifles. Though requiring a muzzle brake and absolutely mandatory hearing protection for the shooter and everyone around the shooter, it is a far more manageable option for the long range sport shooter than the .50 BMG, for example. 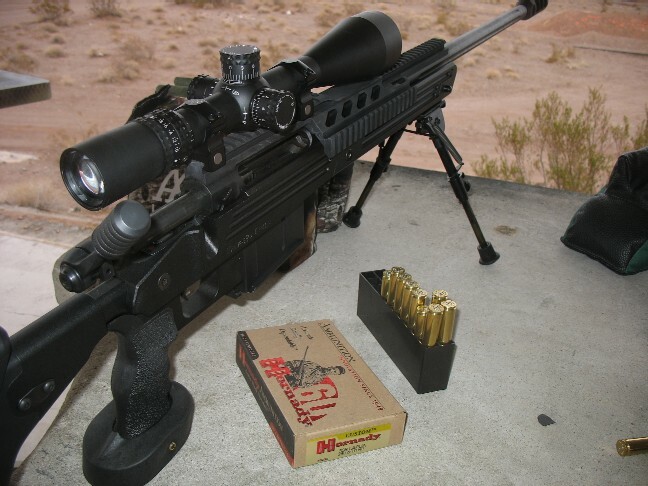 At the range in Las Vegas, the Savage 110 BA was routinely popping targets at about 880 yards. Here's a look at the Savage specifications for this new rifle. With the new Accu-Trigger, Accu-Stock Savage, you are looking at one of the most advanced rifles of its type ever offered, at somewhere around $1500 less than a Sako TRG-42. Extreme long range aficionados have a lot to get excited about this year.